Cohen Memorial Hall was made possible through a gift to the George Peabody College for Teachers from Mrs. George Etta Brinkley Cohen in 1926. The facility grew out of the Peabody art faculty’s belief in enriching the educational experience of future art teachers through first-hand access to art, and the importance of fostering visual literacy in taste and art appreciation. These values were not unique to Nashville; rather, they were part of a broader national trend in education, in particular, art education that found inspiration in the English Arts and Crafts movement. In addition, the building fulfilled several of the donor’s goals, as mentioned in the October 1926 edition of the Peabody Alumni News: “to be of service to others and to place before their fellow men treasures of art and culture, as well as to advance the interest of education.” In a fall 1926 draft of a brief titled “Art in Our Public Schools,” Marshall Olds of the Peabody Educational Program, New York, made an argument for “an arts laboratory” in which “the invaluable study material Peabody College now possesses may be made available for study and use.” He continued by stating the importance of “study rooms, studios, and lecture rooms adjacent to exhibition and reference rooms,” all to serve the needs of the School of Fine Arts. As early as 1913, George H. Sullivan and his mother, Mrs. Algernon Sullivan, began giving works of art to Peabody College. The college initially exhibited the Sullivan Collection (as it became known) campus wide, but the donor and the college considered the building of formal galleries to exhibit this growing collection to be central to the project. The Department of Art, as well, viewed accessibility to the Sullivan Collection and select art objects from Mr. and Mrs. Cohen’s collection as an important component of a comprehensive art education curriculum. Groundbreaking began in the winter of 1927 shortly after the college awarded the contract for the design of the fine arts building to prominent New York architectural firm McKim, Mead, and White, and chose New York builder Hegeman-Harris Company, Inc., to construct the building. Art professor and chair of the department George S. Dutch created “lantern slides” throughout the building’s construction, with the earliest dated March 15, 1927. The three-story building, with its decorative Flemish bond brick exterior and limestone trim and ornament, was completed in 1928. This jewel of a building had a two-story atrium and grand staircase; fine tesserae and marble floors; marble columns, balustrade, and wainscoting; and an arched ceiling with skylight. In the building’s original form, two barrel-vaulted ceilinged galleries, each two stories in height, flanked the central foyer and atrium. The grand staircase led to the third floor where, on the north and south sides of the atrium, balconies provided a view down into the galleries. Until her death in 1930, Mrs. Cohen maintained a modest apartment toward the east end of the third floor, overlooking the lawn. With its neoclassical façade, the Cohen Building contributed to an overall architectural plan for Peabody College, where a central lawn became framed by a series of buildings, each with columns and pediments. This plan, much of it the work of Warren Manning when he designed for architects Ludlow and Peabody, New York, culminated in the Social-Religious Building (now the Wyatt Center), which emulated both Jefferson’s Temple of Knowledge (the library) and its predecessor, the Pantheon in ancient Rome. Overall, the Peabody campus reflected a larger, national trend in campus planning at the beginning of the twentieth century that found its inspiration in Jeffersonian classicism. In 1932, discussions began between Rudolph B. Binnion, comptroller and treasurer for Peabody College, and the art patron George H. Sullivan, concerning the addition of two wings to the art building. Shortly before the stock market crash of 1929, and just one year after the completion of the building, Mrs. Cohen’s gift of stock had a one-time paper value of $750,000 and was seen as the means for eventual expansion of the building and the art department’s curriculum. The economic climate following the stock market crash, as well as the impact it had on the value of Mrs. Cohen’s gift, precluded any plans for expansion at that time. Caring for the Peabody College art collection in the early years of the building soon became a central concern. Several letters between the donor George H. Sullivan and then Department of Art chair George S. Dutch addressed those pressing issues, resulting in a monetary gift made by Mr. Sullivan in 1937 to have painting storage racks constructed. While additional racks have been added as a part of the current renovation, the 1937 racks are still employed today in the gallery’s storage vaults, along with numerous improvements to environmental and security conditions. Just over thirty years after its construction, Peabody’s museum of art was renovated under the direction of August L. Freundlich, chairman of the Department of Art, and opened to the public on March 27, 1960. That renovation spurred the art department’s interest in strengthening the museum’s collection through the addition of contemporary art, including works by artists such as David Hockney and John Chamberlain, while continuing to enrich the historic collection through acquisitions that included the Kress Collection of Renaissance paintings. Throughout the 1960s and well into the 1970s, Cohen Memorial continued to serve the art department and Peabody College by the exhibition of art from the collections and work by students, as well as through a growing studio arts program that produced such nationally recognized craft artists as Sylvia Hyman in ceramics and Michael Taylor in glass. One year after the 1979 merger of Vanderbilt University and Peabody College, Vanderbilt’s studio art program moved from Old Science Hall (known today as Benson Science Hall) to the first floor of Cohen. The faculty assumed the balance of the building, where they continued teaching art until the 2005 opening of the E. Bronson Ingram Studio Arts Center. While the Fine Arts Gallery maintained an art vault and other facilities in the Cohen Building after the Department of Art moved, the Peabody College Professional Institute used the remainder of Cohen, along with Dining Services, during the construction of The Commons. The recent renovation, completed in the summer of 2009, represents a new chapter in the life of this esteemed building. 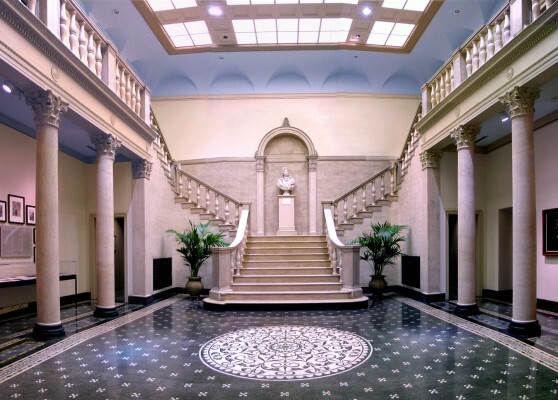 The university thoughtfully and carefully renovated Cohen Memorial Hall to house the Department of History of Art, the Department of Classical Studies, and the Vanderbilt University Fine Arts Gallery. Vision for a great university comes from its leadership. Nicholas S. Zeppos, chancellor of Vanderbilt University, and Richard C. McCarty, provost, deserve acknowledgement for embracing this project and recognizing its value to the university. With the support of the College of Arts and Science (Carolyn Dever, dean), this adaptive use of a historic building has become a reality. Merging a historic building with new construction is never an easy task. Allard Ward Architects, LLC, and Knestrick Contractor, Inc., with coordination through Vanderbilt’s Campus Planning unit, handsomely accomplished this feat. Cohen Memorial Hall’s current incarnation is the fulfillment of years of dreams by many that now have come to pass. As noted in the October 1926 Peabody Alumni News article heralding the original gift from philanthropist Mrs. George Etta Brinkley Cohen that made the building possible, it was George Peabody who said, “Education is a debt due from present to future generations.” Vanderbilt University and the College of Arts and Science embraced this statement in kind through the support of the remarkable rebirth of this building that will serve generations of students to come.